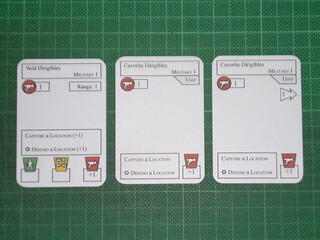 In the early stages of making cards for a game I do the art on A3 sheets of paper, with the cards in a 5 x 5 grid. I've got a blank document ready in Adobe InDesign which already has all the document guides to line things up to and the cutting guides ready prepared on a separate layer. 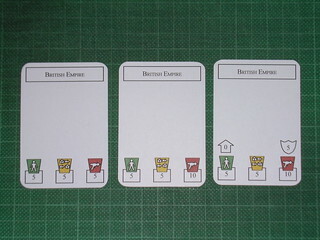 Having the document with A3 print size is convenient for printing, and works fine at the beginning when the card count and mix is changing regularly, but once things start to settle down it is good to move to a new format. For Carpe Astra and Sumeria I got the printing done by LudoFact one of Germany's big games printers. They want to receive the cards as a print quality PDF or PostScript file, with one card per page, each page the size of the cards themselves. So I had to make a document where the page size was 56mm x 87mm (a standard card size, apparently). 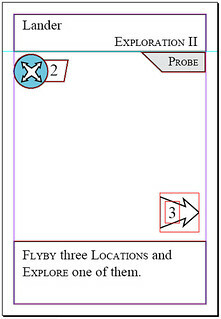 This is actually pretty convenient for doing the rulebook too, as it's easy to place a page of another InDesign document as a graphic in a document, so I could place page 40 of the cards document to get a particular card for illustrating an example. Switching to the smaller form factor too early makes thing awkward as you now have two documents to update before printing: Make the changes to the single cards document and then go to the A3 print document, update the links and delete pages and re-add them to make the changes to the card counts. But once the card balance is steady it's not bad at all. All you need to do is open the A3 print document, update the links to the modified single card-per-page document and then click print. 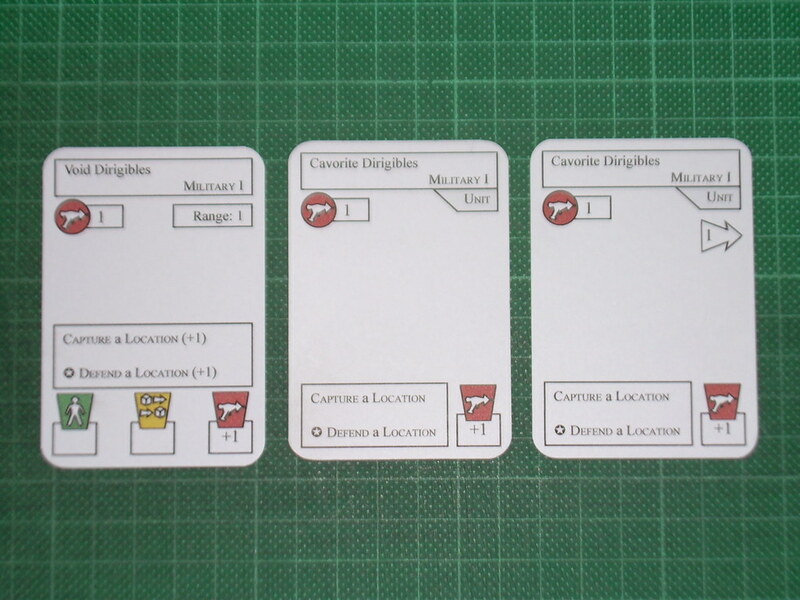 In fact, in some ways it makes things slightly easier, as while working in the A3 print document I keep the cutting guides layer hidden so that I don't accidentally drag some of the cutting guides around with the card art. On at least two occasions I've forgotten to show the cutting guides again before printing, which means I need to either mark the guides on with pencil (a real arse when there's 36 of them per page and 14 pages) or print it again and waste loads of card. Having them separate means that I'll no longer be doing anything in the A3 document, so I can leave them permanently enabled. Of course, seeing as I'm moving things around, I'm taking this chance to tweak a few of the cards again and do a little bit more layout/pictography improvement too. Barely a week goes by without me making some small changes to the game. Fortunately, I'm not thinking of backing out the bigger changes between my current version and the previous one - just improving the balance of some of the weaker sets of cards. The next step after changing the size of the document and getting the print document to link to the new one is to do a proper rulebook. Initially the rulebook was just a set of notes for me. The current rulebook is a complete description of the (previous version of the) game (but without examples or any illustrations/clarification). I need to update the rulebook to the new rules and get it into a finished enough state that people can learn the game blind from it. Then I hope to send it to a couple of my previous gaming groups (which obviously requires making a couple of extra copies) and possibly to some of my far-flung Reiver Games playtesters (or I might wait for that until I've incorporated feedback from my ex-gaming chums). 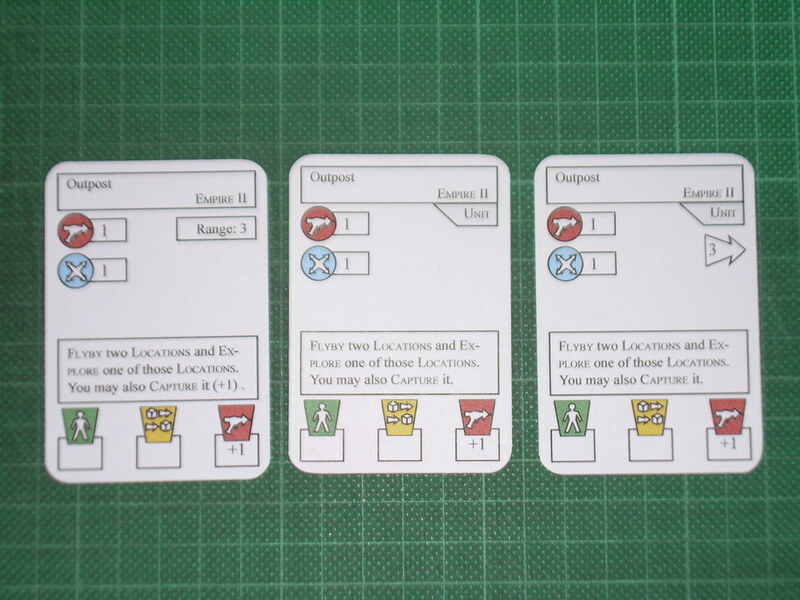 The other advantage of the single-card per page version is that it allows me to set up an A4 print document that's easy to keep in sync as things change so that I can provide print-and-play copies to selected others (seeing as most people don't have an A3 printer). 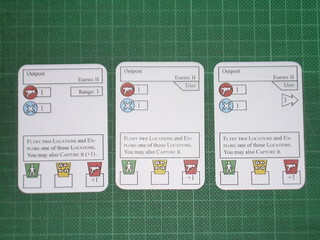 A couple of weeks ago, I posted some pictures of a few cards from the last three versions of Codename: Vacuum. The pictures showed small incremental changes to the cards over time with functionality disappearing to later reappear, or subtly changing over time. But what was probably most noticable about all three versions was the lack of artwork. The cards were 90% white. Why the lack of art? It's a combination of reasons, but the most relevant is that I don't have the skills, and nor do any of my gaming buddies in Newcastle. I enjoy doing the layout and pictography, but I just can't draw to any reasonably level. I could download some vaguely relevant clip art from the internet, but I'm not a fan of copyright infringement and for a lot of the cards I have a pretty good idea in my head what they should look like, and finding those images through a Google search would take days - time I don't have to spare. For some designers, doing the art is as much a part of the game design as coming up with the rules and components, but not for me. Nor do I have anyone who can do the art for me as a favour or for fun. As a workaround I could rustle up some home-drawn crappy art, but I figure that would look worse than none at all - at least a compelling name and a blank page will conjure up a picture in the players' mind's eyes, whereas a badly drawn and coloured picture that would cause my dad to disown me (he's an artist and retired art teacher, though sadly not in a relevant style) would just turn the players' stomachs. I could get someone with the chops to do the art for me, but there's a lot required, and I don't have the funds to pay someone for that work (my money's going on nappies at the moment). I can't expect an artist to work for free, or for the promise of future funds if I publish the game because that's not fair to them - especially as the game may never get published and they may never get paid or get to see their art get published. I don't mind working for free for something I'm passionate about (as evidenced by five years of running Reiver Games), but I can't expect the same from others. So Codename: Vacuum languishes in its stark, white beauty. I've had a chat on Twitter with an old friend from my childhood who I've got in contact with again recently, he's a professional animator (and hence artist) and has offered to lend a hand in his limited free time, but again, I don't want to abuse his generosity - he has a family to support too. It's important to get art in there before phase 3: i.e. testing and blind testing in front of real gamers. I'll need at least some teaser art before I start the campaign to raise the funds, I'm sure seeing awesome art on the KickStarter page helps people to decide to part with their hard-earned dough. I've been running this blog since February 2006 when I started to gear up towards self-publishing my first game: Border Reivers. Since then, I (and my fellow bloggers during the community blog phase) have notched up over 650 posts. However, I've only got blogger analytics stats going back to early 2008. During those four years, the blog has had around 2,000 page views a month on average. Recently it's been lower than that (there was a year or so during which I only posted twice, after the death of Reiver Games) and once it got as high as 3,400 hits in a month (when, bizarrely, www.microsoft.ca linked to it!). My posts have generally been fairly quiet: only three have broken 500 page views with one (linked by Microsoft!) over 3,000 views. Since I can only assume the Microsoft thingy was a typo on their site, I never imagined I'd be getting back to those heady heights of popularity again, my goal for last month was to hit the 1,800 views that I'd had the month before and to try to post weekly. Then I wrote this post about what worked and what didn't with Reiver Games. It's fairly innocuous, I think you'll agree, but W. Eric Martin felt it was worth of a link on the Board Game News section of BoardGameGeek. Off the back of that link I had 500 (yes 500!) views of that page in a single day, shunting it immediately into my top three posts of all time. The month was looking pretty good too, with nearly a thousand views in the first few days. But that was nothing. Someone decided they liked it enough to post it to the Reddit sub-reddit on board games the next day. That day I got over 2,000 views on that one page, almost all of them coming from Reddit. That page is now firmly ensconced in second place among my most popular posts and last month leapt to my most popular month of all time with 4,700 views. When I started this blog it was to publicise Border Reivers, and then after the community phase I ran as a marketing tool for Reiver Games. In neither capacity was it particularly successful, but I'm still learning what it takes to attract traffic. Of course, now I'm not using it for anything really, more as a vanity project to record my new design efforts and to (hopefully) provide useful information for people who are considering or have just started setting up a publishing company. I've not got anything to sell or a company of my own to promote. Getting links from the likes of Reddit can really transform the reach of your blog (if only for the one post that was posted to Reddit), so if I was trying to sell something, getting the attention of Reddit would be something I'd be trying hard to push. As I mentioned last week, I've finally got into the habit of playing lots of Codename: Vacuum. Initially when creating a new game, I playtest solo (pretending to be two or more players), until I'm fairly sure I have something that could charitably be called a game. I don't enjoy this phase: for me, gaming is a social pastime, a way of spending some time with your friends. Sitting in a room pretending to be Jack, then Jacques, then Jaime and finally Jackie, before pretending to be Jack again, all the while knowing exactly what cards everyone has and what strategies they are all pursuing is not my idea of a fun evening in. But by the same token, I don't want to trot out some total crap that I've not even tested with anyone else in case they disown me and start blanking me in the street - a prototype has to at the very least work as a concept before I try it out with other people. So then I start playing it with friends, or a dedicated cadre of hardened playtesters. They either like me, or enjoy playtesting (or, conceivably, both) and so are willing to cut me some slack if the game is a bit weak. Which it will be. But the only way to find out what the weaknesses are is to test it, and that's what friends are for. As you play it a bit more with other people who try different strategies and have different ideas you find out the flaws and have a chance to fix them. 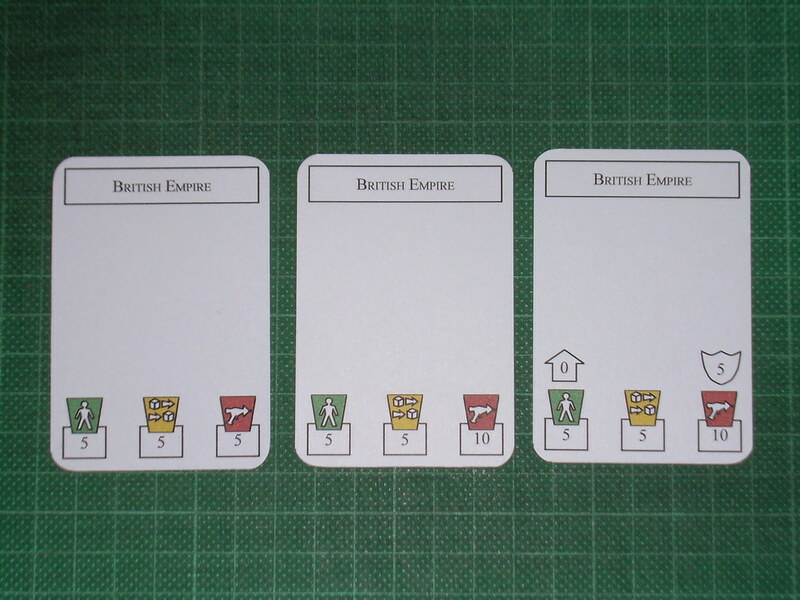 The game goes through more iterations, some better, some worse, but hopefully on an upward trend. Eventually you are going to want to trot it out in front of real gamers, to get an idea of whether you game is awesome. If it's not, it's back to the drawing board, there's a boat load of mediocre games out there, and KickStarter has just lowered the hurdles to publishing, so it's easier to get a game to market than ever before. You don't want to be one of the dregs, you want to be one of the cream. At this stage your game still won't be awesome yet, but it has to pique enough people's interest to warrant further investment. Gamers playtesting your game have to at least see the potential awesome, otherwise they won't bother playtesting it instead of playing this week's new release. The sooner the game is in front of real gamers the better, but, if you do it too soon, instead of the word on the street being 'I playtested that, it was neat, and it's probably even better now' it'll be 'I playtested that last year, what a dreadful, boring, totally unbalanced waste of time'. Word of mouth is great as long as it's in your favour, so you have to time the exposure right. Thematically it fits together nicely, the cards make sense and I like the Steampunk to Sci-Fi transition. People get excited when they see certain cards, which is great. It's a working game. You can play it with a strategy in mind from the start and there's plenty of strategies available. You have to interact with your opponents and modify your strategies to respond to them. It's fairly quick, two player learning games are taking 45-70 minutes and three player games once we've all played it at least once are coming in around an hour. It works across the player range. I wanted it to be 2-5 players, and having now played it with 5 players, I know it works across the whole range. The game is still a bit longer than I'd like, ideally it would be playable in under an hour and around 30 minutes if you've a lot of experience. There's a trade mechanism in the game, but it only really makes sense if you're trading with yourself (or at a push between yourself and the neutral player), I'd like it to be a more inter-player thing, but that will probably slow things down further. It's still hideously unbalanced, and will remain so through the next several iterations I imagine as I make fairly sweeping changes between versions. One of the cool things about Dominion is trying to work out which combos of cards from the set you're playing with this time will be the most powerful, having something like that feeling in Vacuum would be really cool. It doesn't have it yet. In slightly better news, I've got a new version now, it's mainly addressing balance issues I've found so far, but it will inevitably introduce some more of its own. In addition to finding and fixing those, the other things I still need to work on are a more interactive trade mechanism and reducing the game length. In starting to run before you can walk news, I'm now rather optimistically starting to think about how I can get the game to market (if I can get it into a great enough state). There's some small publisher interest or I could tout it to the big guys or even go it alone via KickStarter. I need to get it finished first though!